Cancer of the head and neck are often curable if found early. GKENT is the premiere group in the region for treatment of disorders and cancers that occur in this vital area of the body. Our otolaryngologists offer expert care for all forms of head and neck cancer, including benign and malignant tumors, infections, and cancers affecting the larynx, thyroid, skin and mouth. Treatments might include surgery, radiation, or chemotherapy. Tobacco and alcohol use are major contributors to cancers of the head and neck. 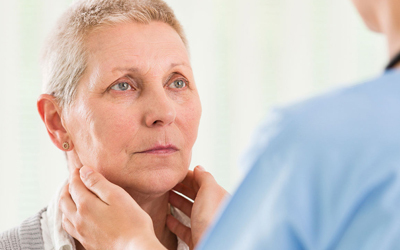 Learn more about some of the common types of head and neck cancers we treat at GKENT below. Symptoms of Laryngeal Cancer, or cancer of the larynx (voice box), can include a sore throat or cough that does not go away, ear pain, a change in the voice, or a lump in the neck or throat. Oral Cancer, or cancer of the mouth, is twice as prevalent in men and often begins as a sore, lump, or ulcer in the mouth. Other symptoms can include difficulty chewing, pain or difficulty swallowing, speech difficulty, or swollen lymph nodes in the neck. Skin Cancer of the Head & Neck occurs when malignant, or cancerous, cells are found in the outer layers of skin in these specific areas. Symptoms might include sores that do not heal, enlarging bumps or nodules, or changes to size, texture, or color in existing moles. Thyroid Cancer usually presents itself as a nodule on the thyroid that rarely causes symptoms. Only 1% of thyroid nodules are malignant. Additional symptoms can include hoarseness, neck pain, or enlarged lymph nodes. GKENT physicians are the most highly qualified to diagnose and treat all forms of head and neck cancer.